One topic addressed in the January council meeting was what happens if a developer wants to join a project and contribute and sends e-mail to the project or its lead, but noone picks up the phone or answers e-mails there… General agreement was that after applying for project membership and some waiting time without any response one should just “be bold”, add oneself to the project and start contributing in a responsible fashion. A second item was the policy for long-term masked packages. Since a mask message is much more visible than, say, a post-installation warning, the decision was that packages with security vulnerabilities may remain in tree package-masked, assuming there are no replacements for them and they have active maintainers. Naturally the mask message must clearly spell out the problems with the package. Gentoo installs and to submit improvements via pull requests (see README  for some details). method and a pull request-based workflow for submitting fixes. The auto-synced repository can also make proxy-maint workflow easier. a. if you want to help us, join the team, watch the pull requests. directly after the changes are reviewed and ready :). 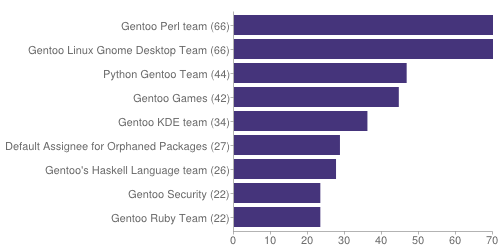 Gentoo is made up of 246 active developers, of which 36 are currently away. 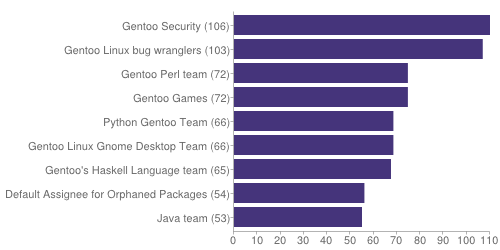 Gentoo has recruited a total of 807 developers since its inception. No GLSAs have been released on January 2015. However, since there was no GMN December 2014, we include the ones for the previous month as well. 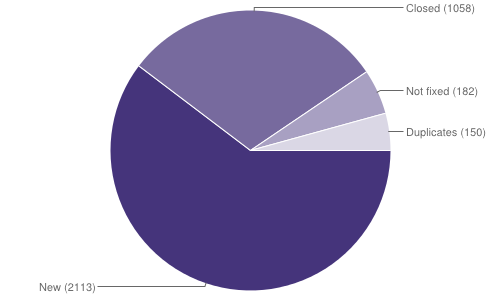 The following tables and charts summarize the activity on Bugzilla between 01 January 2015 and 31 January 2015. Not fixed means bugs that were resolved as NEEDINFO, WONTFIX, CANTFIX, INVALID or UPSTREAM.